A consortium led by The Nature Conservancy (TNC) has successfully tendered for the future stewardship of Nimmie-Caira. TNC will deliver a sustainably managed and financed conservation property, balancing environmental, economic and sustainability outcomes for managing land and water resources at the site. Importantly, they will deliver an asset for the long-term benefit of the local community and Aboriginal groups. TNC is a global conservation organisation dedicated to conserving the lands and waters on which all life depends. The consortium for Nimmie-Caira includes the Nari Nari Tribal Council, the Murray Darling Wetlands Working Group and the Centre for Ecosystem Science at the University of NSW. The NSW Government will work with the Commonwealth and TNC to ensure the long-term Land and Water Management Plan objectives are monitored, evaluated and ultimately met. The $180 million Nimmie-Caira Project is a significant water saving project for NSW and particularly for the Murrumbidgee region. 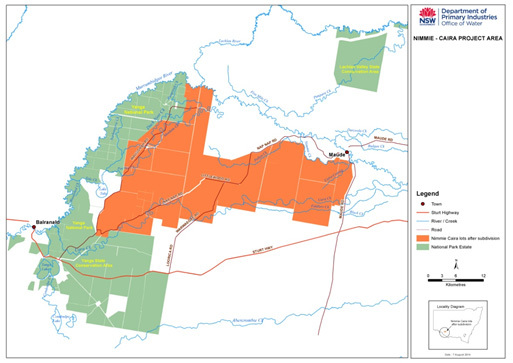 The Nimmie-Caira project area covers 84,417 ha in the lower reaches of the Murrumbidgee River floodplain (the Lowbidgee) between Maude and Balranald, South Western NSW. It is a vital component the Lowbidgee being the largest remaining area of wetlands in the Murrumbidgee Valley. The project aims to balance the environmental and Aboriginal cultural heritage protection with commercial use so as to create an asset for the local community and the Murray Darling Basin. Land and water purchase. The project purchased 19 properties on the Nimmie-Caira floodplain, together with their share of the Lowbidgee Supplementary Water Entitlement (381,000 shares). Water Savings to 'Bridge the Gap'. Water entitlement purchased from landholders transferred to the Commonwealth to help 'bridge the gap' to meeting Sustainable Diversion Limits. Environmental Watering Plan. To document the demand for environmental water within and beyond the project area. Long Term Land Management Plan. To outline how the area will be managed into the future with some land managed for Aboriginal cultural heritage and/or environmental values and other land managed for commercial use. Reconfiguring the water delivery infrastructure. To enhance the delivery of environmental water to lands identified as having high ecological value. Click on the map below to download a high resolution version.